Patrick has evolved and refined many of the dishes from his childhood, making them relevant in a new century while keeping their soul intact – building a sort of culinary bridge between past and future. 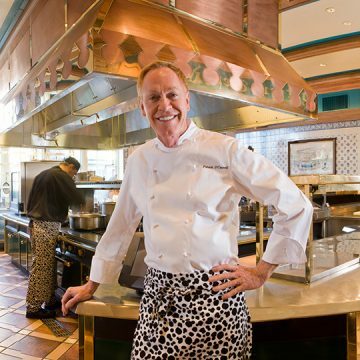 His commitment as an Ambassador of American Cuisine has fueled his involvement in the international association, Relais & Chateaux, where he currently serves as President of Relais & Chateaux North America. O’Connell is the author of the best-selling cookbook, The Inn at Little Washington Cookbook, A Consuming Passion. Of his second book, Patrick O’Connell’s Refined American Cuisine, Governor Mark Warner said “Not since Thomas Jefferson first brought tomatoes to Virginia and the New World has one man created such interest in the culinary arts.” His third, The Inn at Little Washington: A Magnificent Obsession, is a New York Times bestseller tells the story of The Inn’s remarkable 36-year transformation from a rural garage to the sumptuous country house hotel it is today.